Do your students struggle with the words somebody, anybody, something, anything, everything, everybody, nothing and nobody? Do they get these basic words wrong nearly every time? If your answer is yes, then this post is just for you. 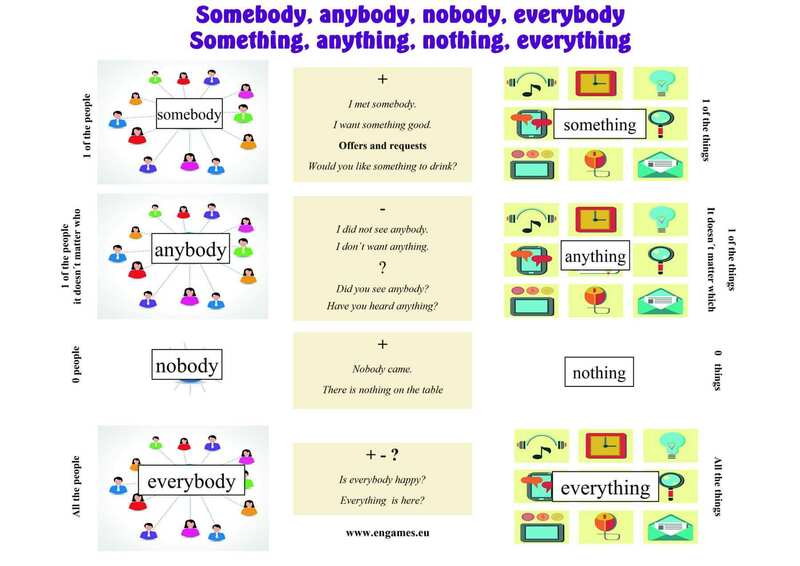 In this post I would like to share with you several tools to help your students use the words somebody, anybody, something, anything, everything, everybody, nothing and nobody correctly. In this post you will find an infographic and two games. I hope you will like it. Display or print the following infographic and ask the students to read through it. Then elicit what they learnt. If you feel that they did not get the message, explain the grammar using either their MT or your own words. Mention please, that the word BODY, could be replace with ONE and the meaning will be the same. Emphasize the spelling of NO ONE (two words instead of one). Somebody or anybody, something or anything – What more? I realize that the post is rather short. What do you think would be the best activity to add? What activity should I add? Hello, You’ve done a great work on your website. How can I have this infographic about somebody, anybody etc.? I’ve saved the image, but isn’t so good. What do you mean? Do you mean that the image quality is not good enough? I could send you the image with more details. Yes, you’re right, I meant this. If it’s not too much to ask, I would appreciate it if you could send the image to my email. Sorry, it took some time, but it has been sent. It was a great info but It is focusing on accuracy what I’m wondering is to how make my students to use them inductively through the engagement? That is an interesting question. I am afraid, I cannot answer it.